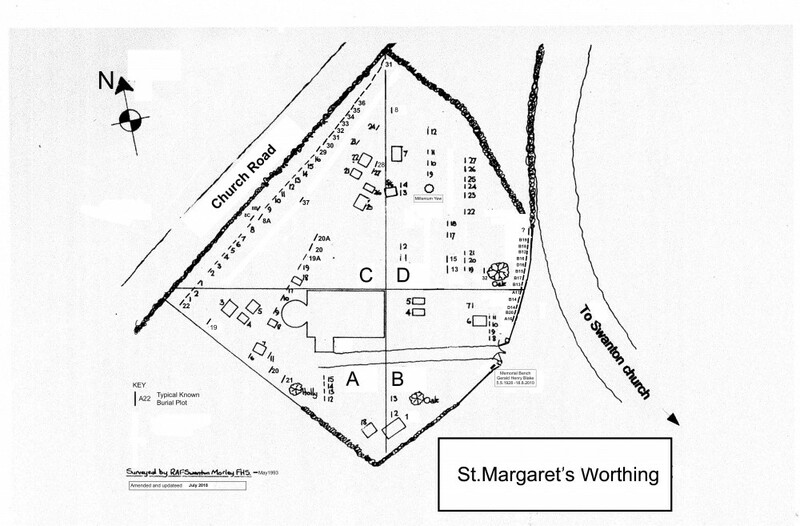 St Margaret's Church in Worthing has taken the historical records held in paper format and digitised the information so that it can be accessible electronically through this website. The aim of the project has been to make the information far more widely accessible than before so that anyone researching their family history can hopefully make use of this resource. The image below shows the layout of graves in the churchyard. The area is divided into four sections A, B, C and D. Graves are then numbered in each area starting from 1. Below is the list of historical records held. The data is correct at time of publication on this website, during May 2018. The information has been extracted from an existing Monumental Inscriptions records book (compiled in 1993 and used on this website with the kind permission of the mid-Norfolk Family History Society) and updated where appropriate following more recent research of the churchyard and the Register of Burials 1813-2004 transcribed from the original registers in 2005 by David Knight and compiled by mid-Norfolk Family History Society. Mary ALLSEBROOK was buried on 16 October 1843 and her grave is at plot number no D15. This can be located on the map above, within section D, plot number 15. Where a Register Number (Reg No) entry is underlined in the table it is possible to click on it to access further information e.g. an image of the gravestone or detail from the Monumental Inscriptions records book. 209 1910 Dec 16 PHILLIPPO Susannah 74 of Nfk Co. Asylum, Thorpe St Andrew. .